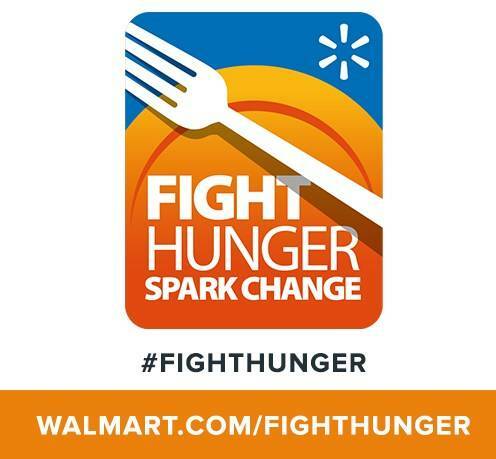 Walmart will continue running the Fight Hunger. Spark Change. promotion through the middle of this month. They are hoping to give out $1.5 million nationwide to end hunger. 1) Product Purchase: Each participating item purchased at Walmart or through Walmart.com will unlock a donation equivalent to one meal* secured by Feeding America® on behalf of local member food banks from each supplier. 1 item = 1 meal ($0.09) up to each supplier's maximum donation. 100% of funds will benefit local member food banks (Second Harvest). 2) Register Giving: customers can donate to their local Feeding America member food bank (Second Harvest ) at the registers of Walmart stores. Donations of $1, $2, $5 or another amount will be accepted. There is no limit to what can be raised at the register! 100% of funds will be directed to local member food banks (yes, Second Harvest, again!). 4) Discover Card: For each transaction using Discover at Walmart and on Walmart.com, an additional meal* will be donated by Discover. Funds will be shared between the national office and network food banks. So there are plenty of ways that you can participate in Walmart’s Fight Hunger. Spark Change. Campaign which will benefit Second Harvest. Choose your Walmart store. Choose your option and then do it by May 15.